KIM COLLISTER STUDIO: WHAT'S SHAKING? Wow, until recently the word 'earthquake' was just a word that was associated with other parts of the world that deeply affected me when I would watch the news of their appearance on t.v. and my heart would just ache for people that were affected by this natural (or unnatural) occurrence of mother nature. However, once you feel that ground move beneath your feet, that word becomes very REAL. There has been a lot of shaking going on here in Central Arkansas lately and that has made a lot of folks here really nervous not knowing what is going to happen or when. That's a whole other story and you may have heard all about it on the news. People here seem to think that all the oil drilling going on in this area has unleashed the beast. With that said, I do apologize for the delay on my "Bragging Post" about the wonderful door prizes I won during the OWOH Tour. door prizes that I won during the OWOH Tour. I can't say enough about them. I encourage you to visit each of the blogs of these creative souls and not only will you find a wealth of information and treasures there, but you will also meet some delightful kindred spirits that you will want to visit time and stay awhile. Sherry is from Greater London,United Kingdom. I won Sherry's first prize! She crafted this fabulous Fabric Rag Quilted Sewing Bag and matching Pin Cushion! I have it under wraps as several people I know have had their eye on it! 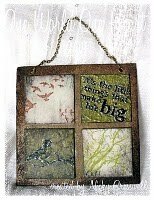 If you would like to see what inspired her and how she made it, check out her blog. It's all there! I am so excited to have it and to meet Sherry! Cyn from North Eastern CT. She is a Chef and Artist. Check out her blog. She has some loving furry friends Pepper and Henry and this lucky girl gets to enjoy blue, green, and pinkish brown eggs everyday! 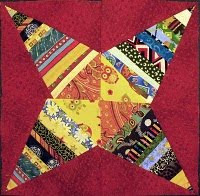 I was fortunate enough to win two of Cyn's gorgeous quilt blocks. She is one busy lady and hasn't had time to get them done yet, but something beautiful, handmade and gifted from a friend is always worth waiting for. Pop in and say Hello to Cyn! You'll be glad you did! Annie from Philadelphia, Pennsylvania USA. A true gypsy @ heart born on Valentines Day! 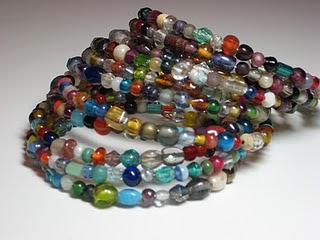 Check out this awesome bracelet made by Annie and so generously given as a door prize. It is even more amazing in person, vibrant and colorful. Annie also included some of her creative art greeting cards, 5 of them! Check out her Etsy shop as well. Drop by Annie's blog and give her a heart! Nicky also known to her artist friends as Minxy. Minxy from Somerset, United Kingdom. Minxy is a self professed altered art artist and craft-oholic. LOL, Minxy girl, join the club, we are here to support you! Check out Minxy's blog and her creative works of art! 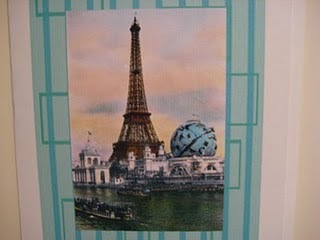 I received this altered art canvas from Minxy as a winner of one of her door prizes! I have it hanging in my entry way and it reads: "It's the little things that make Life Big"....just what OWOH Tour was all about! I couldn't have said it better! Craft-oholics, show Minxy the Love! Thanks for stopping in...I love it when you do! Standing firm on shaking ground! Congratulations on all your wins Kim! I'm glad you like the bag and pincushion and doubly glad that it's gone to a good home! Lovely gifts. OWOH was really fun. I do hope someone takes up the torch next year. Hope the shaking ends soon. Seems good old Mother Earth is getting the trembles everywhere. Hey great way to fature what you won. I wan to do this with what I won if that is OK with you. Cool idea!!! Sorry your house is getting rocked hope ends soon!!! Wow, four door prizes. I was surprised to win two. They haven't came through the mail yet, but what fun. Earthquakes not so much. I've been through a couple living in California and all. The last one sounded like a freight train, it took a few seconds to realize what it was. My kids wouldn't let me out of their sight for a week. But I was in Oklahoma visiting my parents when the tornado hit Oklahoma City about twelve years ago. I was up several times during the night, thinking it sure gets windy here. I now know why they build brick houses back there. Hope the earth stays quiet-stay safe.